She does amazing things with her antique letterpress and she designed and pressed my business cards - which I absolutely love!! If you aren't familiar with letterpress- you will most definitely want to check it out. Instead of something being printed onto paper- it is pressed and Via uses an antique press to do her work in Berkeley. The result is a beautiful embossed type feel and finish to the card. 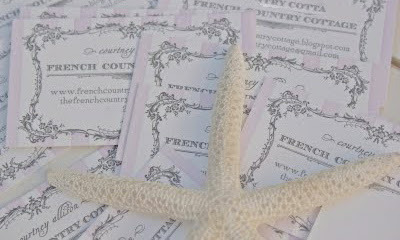 She does weddings, invitations, Holiday cards, business cards and much more. She has worked with celebrities (that we can't talk about of course!) and been published in Martha Stewart Weddings as well as many other publications. some goodies using lace and she thought of my readers when she saw how they turned out. Aren't they so cute? I think they are darling! There are 2 little notebooks that have stitched detail and 2 beautiful cards as well. for yourself or for giving as a gift. She has offered a pack of these treats as well as a $20 gift credit to Olive- Route at her Etsy shop! and let me know you did any of those things in a separate comment. I just left a note for Via on FB. What a lovely giveaway. I ADORE letterpress!!!! My daughter did letterpress for her wedding invitations. So awesome. I don't know if I qualify b/c I don't have FB.....but if this comment counts I would be so happy! Thank you, Courtney, and please thank her for this wonderful and generous Giveaway! I can see why your SIL was published! Beautiful work! I left her a note on FB too. Oh my...for a paperlover like me...heaven! So pretty! I saw an antique letterpress in Florence Italy in a small paper shop about five years ago...I still remember how lovely those papers were! Heading over to FB now! Count me in! I just want to say that once people see letterpress they won't ever want the usual business cards ever again! I've always loved letterpress items and these are great! How fun to use an antique letter press and what beautiful items she has too. I liked and commented on Olive's FB page. Gorgeous stuff!!!! I shared on Twitter as @mmjohnson55. I added her to my fav's on etsy. Wow! She has some beautiful things! I just said Hi via facebook, and looked at her Etsy shop as well. I love the lace cards. Letterpress is just so exquisite! Popped over to Olive Route FB page to "like" & say hello. Beautiful items & color choices! Shared the giveaway on Places In The Home FB page. I am heading to FB to say hi to Via right away. What beautiful work she does! Never knew much about letterpressing before, but now am looking forward to researching it. What a nice giveaway!! Lovely work and a wonderful giveaway! I also shared the giveaway on my FB wall. just visited Via's etsy shop...love her designs! Especially the octopus and the stars/sneakers design. Letterpress is a wonderful art form, I wish her much success. Joined her page on Facebook (under Katie Watkins) and shared her page with a recommendation! Her work is quite stunning! Im thrilled you shared her work! What a beautiful shop. I just visited her Etsy page and ended her to my circle. I love the octopus notepad. Gorgeous and the Trout note cards. Wish her all the best. I just tweeted the giveaway. Thank you for hosting such a nice giveaway. Letter press is my favorite! Such quality and beauty... what beautiful work! Thanks for the introduction... I can't wait to check it out! Left Via a note on FB and "favorited" her Etsy store. Amazing work!. Thank you so much for the giveaway. Thank you for sharing her wonderful work. Via's work is exquisite! She makes letterpress more than ink on paper--what lovely art. Love Olive's work. Fantastic giveaway!! I commented on Olive's work on FB. Her work is truly beautiful. I love Letterpress and her work is just beautiful! I love that she uses an authentic press! I love this giveaway! Thank you! I LIKED Olive Route on Facebook. I TWEETED TOO! Thanks girls for the awesome giveaway! Beautiful stuff! I "favorited" her shop on Etsy! I'm a longtime follower and have now linked into her etsy site. Oh her items are so lovely...would love to have some of them! I visited her etsy shop--love the Earth print! What beautiful work! Love it! Very pretty - she's very talented. I "liked" her FB page!! I also left a note on FB. Our home is french country and we love it. Olivia is a gifted artist! I like almost all of her designs. Thanks for introducing me to her work! Wow - Via is so talented! I love her world print! Would love to win - the lace is beautiful! I just stopped by and said hi to Via on FB, and let her know how beautiful her work is! Thanks for the giveaway opportunity! Awesome!! I shared with my friends of fb, liked Olive's page, and just feel in love with her wonderful designs. Boy she has sooo much to offer. I saved her etsy page, so I could shop later. Thanks dear for sharing with us! Love them!! Thanks Olive dear for all your beautiful works!!! Hi Courtney, Thanks for the opportunity I would love to enter for your wonderful giveaway...I went to her page and left comment. Love her designs, went and saw her facebook and etsy...LOVE! and just shared the giveaway on FB. Love her letterpress design...just went to her facebook and esty shop...LOVE it!